Google recently introduced page-level ads to allow better mobile Ads. Here are the benefits listed by Google. As you can see, it could be good way of adding extra revenue on top of the Adsense you already implemented. To implement the page-level Ads, you just need to add your ads code to the <head> or beginning of <body>, as shown in the official tutorial. To add it to your WordPress site, you would need to manually add the code to the theme you are using. The exact file to modify may depends on the theme you are using. For my case (Spacious theme), it is located at header.php. You can directly modify it in the Dashboard by going “Appearance”–> “Editor” –> [FILE]. Alternatively, you can modify the header.php. Directly put the code you got from the Google Adsense site in the head section. After save the file, you can test it out from a Mobile phone by adding #googleads to the end of the URL. For example “tipsarea.com#googleads”. 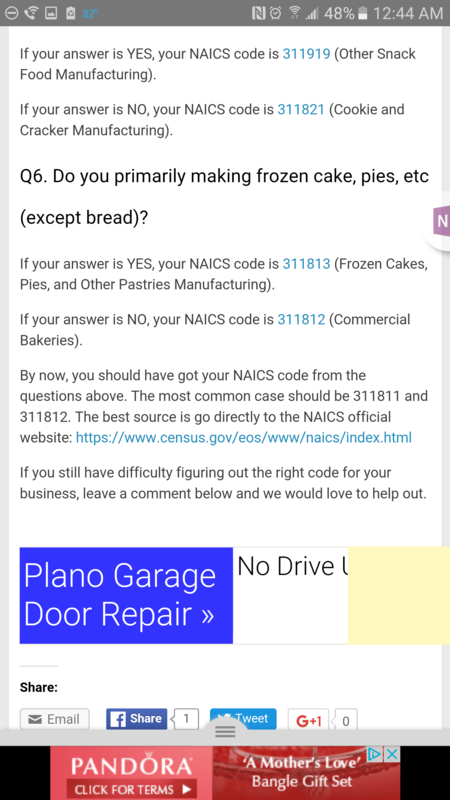 For my case, the test code runs best with Chrome web browser in the phone. Other browsers such as the Dolphin and Android build in browser all returned with error. 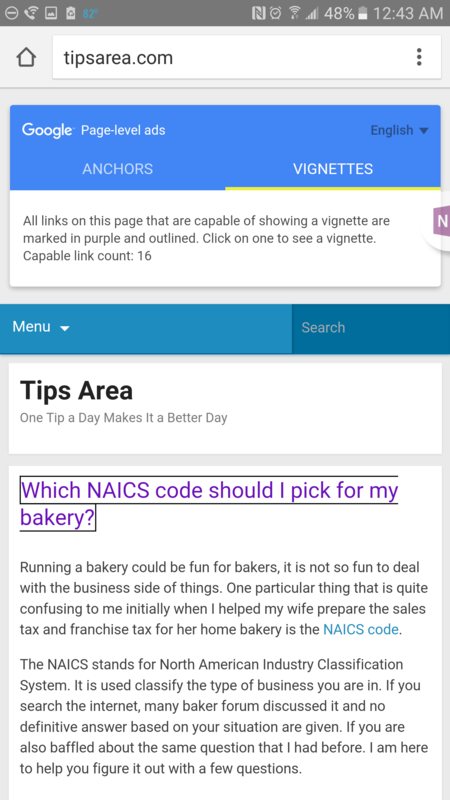 Once it is loaded, you can choose to test out Anchors or Vignettes ads. The Vignettes ads will highlight all the capable links in your webpage. Anchors ads will only show up when you scroll the screen down. To this point I think it is working. One thing that you might want to watch out is for the theme updates which will overwrite the files that we modified. I am not aware of tools that can avoid that. If you know something that can preserve the changes we made, please let us know by leaving a comment. 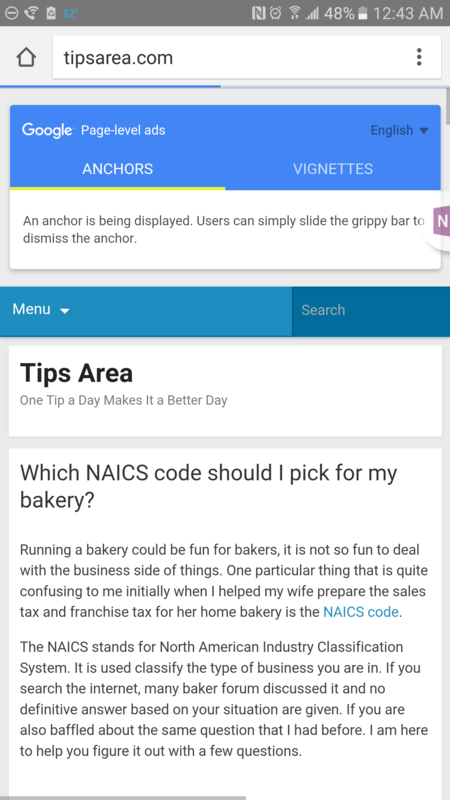 ← Which NAICS code should I pick for my bakery? How to Use Visual Studio Code in Ubuntu VNC Session? Copyright © 2019 Tips Area. Powered by WordPress. Theme: Spacious by ThemeGrill.